She was a tiny woman who spoke remarkably simple words. Yet Mother Teresa used that unadorned speech to bend the will of indifferent bureaucrats, cynical journalists and at least one of the world's most despised tyrants. I know. I was one of those cynical correspondents, running into and interviewing the world's most famous nun while posted in Asia and Africa for The Associated Press. If she had gone into politics instead of missionary work, I thought after first meeting her in India in 1977 after a cyclone, she would have put an Indira Gandhi or an Eva Peron to shame. The thought was reinforced upon seeing her again two years later when she won the Nobel Peace Prize and during the 1984 Ethiopian famine. Few could resist this woman in the homespun, sari-like habit. Born in Yugoslavia of ethnic Albanian parents, she went to India with an Irish order, became a naturalized Indian and founder of her own Missionaries of Charity at a time when foreign clerics were seen as an unwanted vestige of the colonial era. Ministering to the poorest of Calcutta's poor, she won national, and then world fame for her selfless work. ON A STRETCH of coastal road in south India, she came upon a group of government doctors stranded when their vehicle broke down. After she spoke to them briefly, they unanimously volunteered to join her cyclone relief effort, abandoning their own assignments. "It's hard to say no to a living saint," explained a relief official who knew her, a Hindu like the majority of Indians. A priest told me, "Few are left unaffected by her charisma." It was that understated charisma, fortified with well-intentioned chutzpah, that helped bring about what she invariably called "God's miracles." Her caravan of trucks and cars made its way to Mandapakala, a prosperous farming community flattened by the storm. 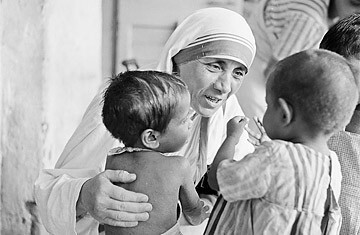 It was piled with corpses the day Mother Teresa arrived to supervise relief operations. Methodically, she issued instructions on the disposal of bodies, a health hazard to the living. "The best thing would be to build a single long trench and lay the bodies in a file," she crisply told members of her order and a crowd of volunteers she had attracted along the way. "That, we discovered, was the simplest method when the floods took their toll in Jalpaiguri in Bengal last year." Many of the survivors wandered aimlessly about the village or picked through rubble in search of a pot to hold water or boil rice. A woman called to Mother Teresa, pointing to her only surviving family member, a 6-year-old deaf mute, and asked: "What will I do with him? Is he worth anything?" The boy approached the nun and played with her wooden rosary. Mother Teresa gathered him in her arms and the child, unable to speak, gurgled with delight. "See," she told the distraught mother. "The child is happy." Turning to those accompanying her, the nun said: "Where there is tragedy, there is salvation. Even when the mother cries, the child finds happiness. It is eternal." IN ETHIOPIA, I witnessed two small "miracles" during a visit by Mother Teresa - and those were aside from all the lifesaving efforts by her missionaries among the starving. Toward the end of my second or third stint in Ethiopia, an AP colleague based in Zimbabwe flew up to relieve me. John Edlin was something of a legend in Africa media circles. A hard-drinking New Zealander, he had lost count of the times his wife had thrown him out. Sent to cover Sen. Edward Kennedy's famine tour, Edlin was too pickled to dictate more than two paragraphs each night of what was a major story. Then he met Mother Teresa. It was an epiphany for Edlin. At first, he considered chucking his job to handle her order's press relations in Ethiopia. (Mother Teresa did this all too well on her own.) In the end, the tough Kiwi became an overnight humanitarian who quietly set up and financed an orphanage for children who lost their parents in the famine. Then he returned to reporting. If the 1984 drought was of biblical proportions, so was the raw cruelty of the country's dictator, Col. Mengistu Haile Mariam. His Marxist regime killed an estimated 150,000 people, and Mengistu is widely believed to have strangled his predecessor, Emperor Haile Selassie. It was well known that the country's Jews, known as Falasha, were persecuted. But Mengistu was equally brutal toward a Lutheran-linked church and to practicing Roman Catholics, said my best source in Addis Ababa, the papal nuncio, or the Vatican ambassador. Ordinary people were terrified of Mengistu and would not utter his name. Unfazed, Mother Teresa requested a meeting with the dictator, telling reporters she would ask him to hand over the late emperor's palace for use as a hospice. She didn't get the palace, but to the amazement of everyone I ran across, she received a piece of land smack in the middle of the capital. FOR A JOURNALIST, interviewing Mother Teresa about herself was a task. Not that she fended off such encounters; she just wouldn't say much about herself. Instead, she'd speak of what she called miracles, large and small, that materialized, thanks to God, when they were needed most. "It's his work, not mine," she told me at the Calcutta home for the dying destitute after she won the 1979 Nobel Peace Prize. "God is our banker. He always provides." She recalled a day at the home when "we found we had nothing, not a single piece of bread to give our people." "You know what happened? For some mysterious reason, all the schools were suddenly closed that day and their bread was sent to us," she said. "Now who else but God could have done that?"